As soon as I saw these Givenchy Fall 2016 suede boots, the fate of my manicure for the second day of NAFW 2016* was determined. I’d die to have these stunners in my shoerobe. Just look at that Egyptian art like heel! Everything to do with Egyptian culture (and Givenchy too!) ranks high in my books. Initially, I wasn’t fond of the colour scheme. Brown and yellow isn’t a colour combo I’d usually wear. But once I started translating the Givenchy pattern into nail art, it looked so beautiful that I kept the original colours. Now I just can’t get enough of this manicure and can’t wait to recreate this look for some of my clients. 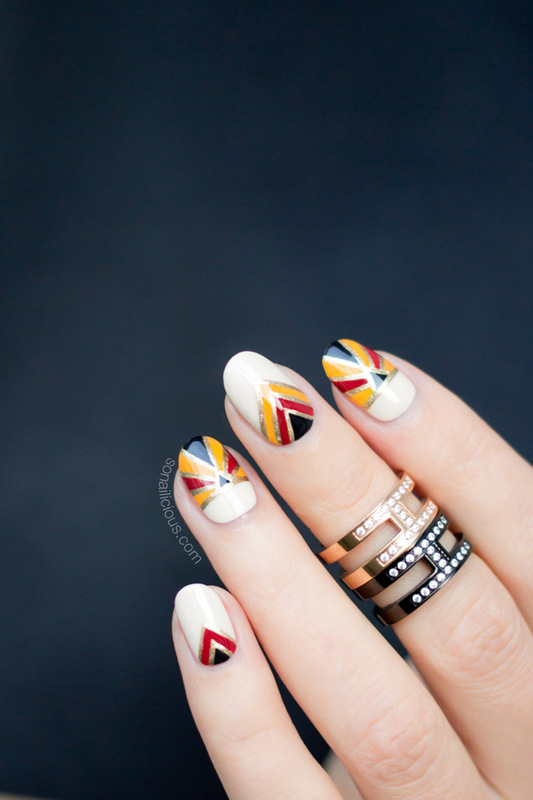 Plus, this Givenchy inspired nail design looks stunning in both matte and glossy finishes. You choose how you wear it! To get the look: To do these Givenchy nails, use the same technique as shown in this video tutorial. 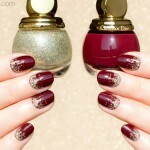 First, apply light beige nail polish on all nails, then paint the golden details/patterns on each nails. Then fill in the details with the different colours as pictured and finish by going over the golden lines once again to correct any errors. Let your manicure dry for a few minutes, clean up if necessary and seal it with a matte top coat. * Download the NAFW 2016 schedule here, if you haven’t already. 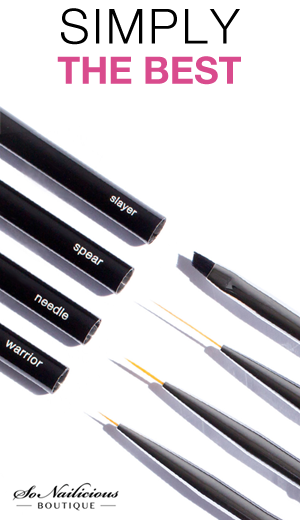 SN Striping Nail Art Brush. Wearing: Gunmetal and Gold Knuckle Rings. What do you think about these Givenchy nails and… the shoes? Would you dare to try a shoe inspired nail design? If you haven’t yet, I strongly encourage you do! 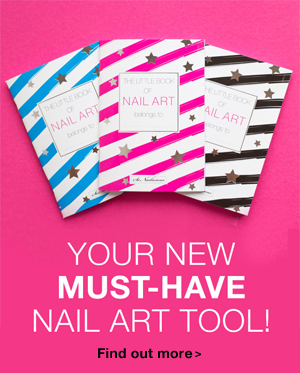 It’s an excellent challenge for your nail art skills and a great boost for creativity. 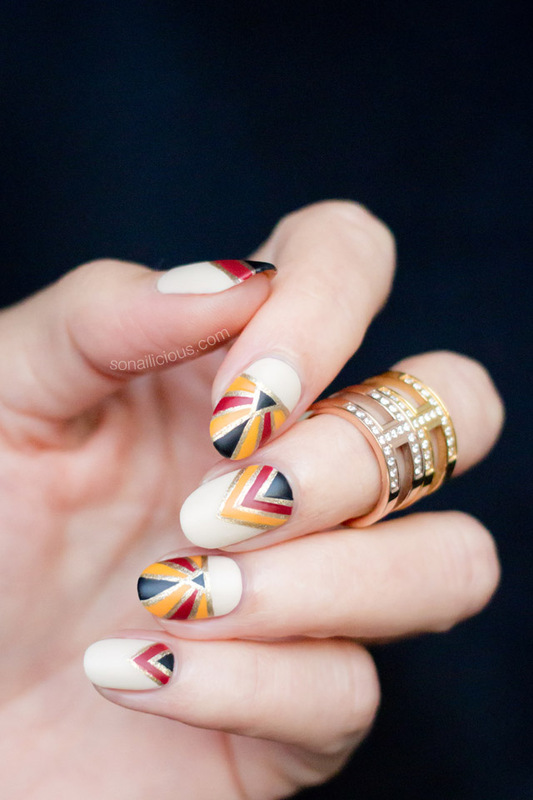 Plus, there are plenty of nailspiration, here and here. And don’t forget to show me show me your creations or recreations – Tweet or Instagram me a photo with the tag #sonailicious, I’d love to see your work! Want to see the playful shoe inspired manicure I did last year? Here it is! P.S. To see all the manicures created during NAFW 2016 follow the #NAFW2016 hashtag on Instagram. For daily updates follow us via Bloglovin or subscribe to our Weekly Newsletter. 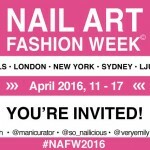 Your Invite To Nail Art Fashion Week 2016!